Setting iTunes to display modified/changed iTunes images can be a real headache. Blubrry Powerpress has developed a relatively simple and easy-to-use solution to the problem. In order to make iTunes recognize that a new iTunes image is present, the actual iTunes image file name is changed slightly. In order to achieve this, please use the upload new image: option. Every uploaded iTunes image takes on a new file name, thus forcing iTunes to re-cache your latest image. You can customize the labels such as ‘Podcast:’, ‘play in new window’ and ‘download’ by adding a few lines of code to your wp-config.php file. Please use the instructions found on the PowerPress wp-config Options Page. You may customize the character or html that is placed between the player and download links by adding the following define to your wp-config.php file. I want to customize my play icon. If you see the blubrry player icon for your audio/video (m4a/m4v), you can customize this by adding the following define to your wp-config.php. Can I center the PowerPress media player? You can center, left or right justify the Powerpress player in your blog posts by adding the following line to your blog’s style sheet, (style.css, typically found in your blog’s theme folder). Simply replace ‘center’ with ‘left’ or ‘right’ to align the player to the left or right respectively. Can I customize how the play and download links look in my blog post? If you are familiar with HTML/CSS, you can customize the play and download links very easily by adding an entry to your blog’s style sheet (style.css, typically found in your blog’s theme folder). The following example sets the links to a specific font size and centers the links in the middle of the page. How can I use my own icons to prefix the media download links? If you are familiar with HTML/CSS, you can customize the play and download links very easily by adding an entry to your blog’s style sheet (style.css, typically found in your blog’s theme folder). The following example adds a PDF icon to the left of the play in new window and download links. There are a number of ways to customize the look and feel of your WordPress + PowerPress podcasting site. If you are writing your own theme and want to either style and/or position your podcast information, the following info will help. NOTE: The code examples below are placed into a WordPress theme’s source code. Basic knowledge how to develop/edit WordPress themes is required. PowerPress includes the following template function for your theme development. The function above allows you to place the PowerPress player and links precisely where you want in your WordPress theme. You can also get the powerpress content to manipulate how you see fit. This first example displays how you can position the player and links specifically where you want in your WordPress theme. 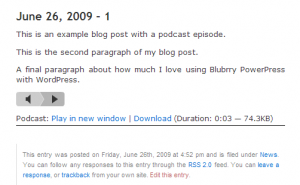 The following example uses the “default” WordPress theme by editing the single.php theme file. In the section between the title and entry…. 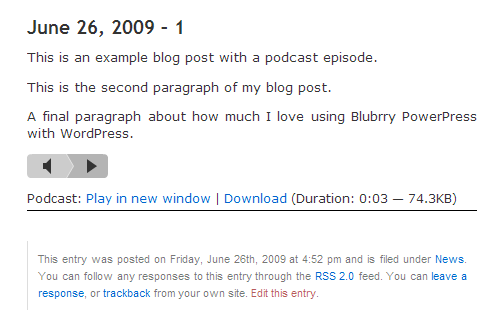 Add the following CSS styling to the style.css to make the background of the podcast player and links. The following will position the player at the very top of your blog post, just below the post title. The CSS adds a line below the play in new window and download links. The following example adds HTML around the PowerPress player and links allowing you to customize further how the information is displayed. This example also uses the “default” WordPress theme, editing the single.php theme file. Add the following CSS styling to the style.css to make a fancy background and lining around the podcast player and links. 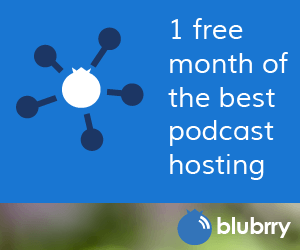 Which will display your podcast episode information like the following screen shot. This function returns an associative array of the meta data stored for the podcast episode. The first parameter $post_id is required. The second parameter lets you specify a specific custom podcast channel feed slug or custom podcast post type feed slug. The default is ‘podcast’. Print the array to see the meta data available by using the PHP function print_r(). Example getting the media URL and iTunes subtitle if set. The play in new window, download and embed links are generated from Episode meta data. These are functions that generate their respective links. They append themselves to the value passed in $content. If $content is not empty, ti will use the value in the define POWERPRESS_LINK_SEPARATOR before appending its own value to $content. The returned value is the appended link to $content. The 3rd parameter $episode_data is required for the Play in New Window and Embed functions. post/page specific data is used instead of the media URL to prevent outside web sites from hot-linking (using their own media URLs) in the new window and embed players.